Have volunteers tell about times they have gone fishing maybe with dad or grandpa. Jesus was walking beside the Sea of Galilee when he saw Simon and his brother Andrew, who were fishermen, casting a net into the lake. 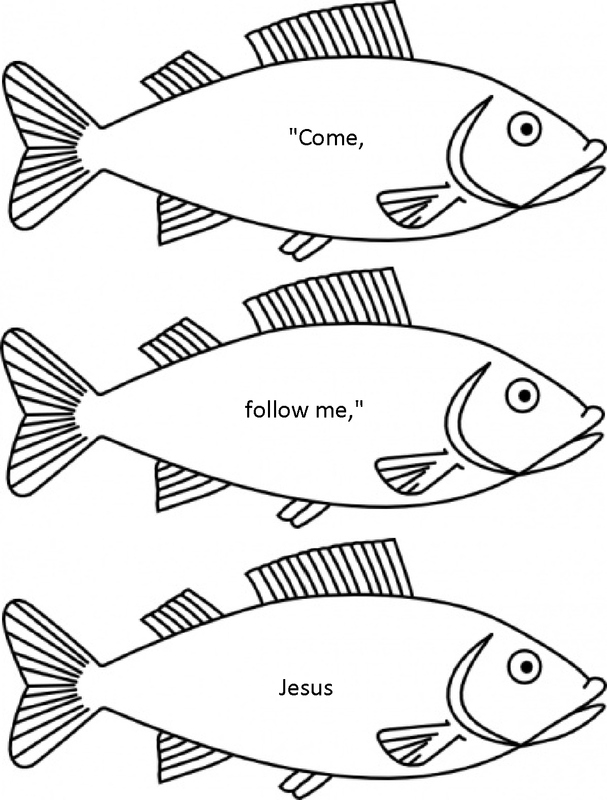 Jesus said, “Come, follow me, and I will make you fishers of men.” At once they left their nets and followed him. When he had gone a little farther, he saw James son of Zebedee and his brother John in a boat, preparing their nets. Without delay he called them, and they left their father Zebedee in the boat with the hired men and followed him. Notice that the disciples in our story followed Jesus at once…without delay. They chose to follow Him without hesitation. Think about your life. Do you make good choices to follow Jesus each day? Discuss. When Jesus talked about making the disciples “fishers of men” he meant that they would be trying to reach people for Jesus. Why would Jesus call them away from fishing for fish to fish for people? (because people are more important) Jesus didn’t want anyone to die without knowing Him so He called the disciples to help Him reach other people. 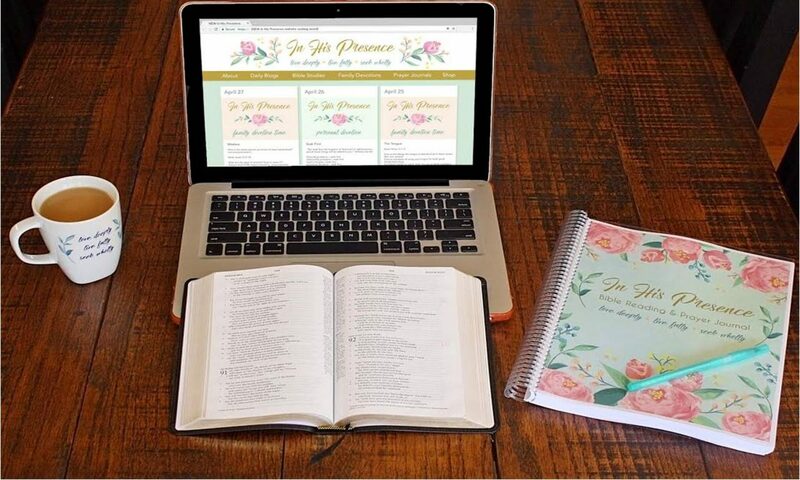 Go fishing for the words that make up the memory verse. 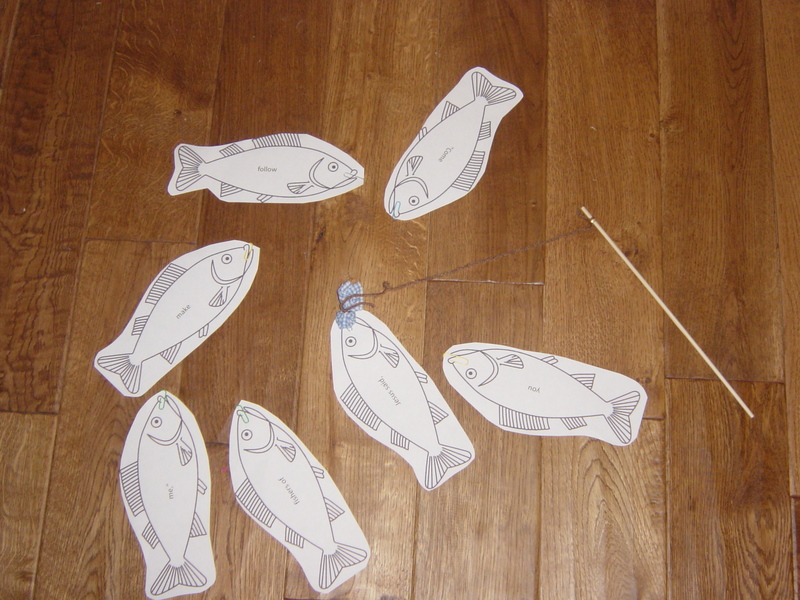 Use the paper fish cutouts and the magnetic fishing pole provided for you with this lesson guide. I created my own fish with the words of the verse on them. Make a water bottle fish by gluing tissue paper pieces onto the outside of the bottle. Attach paper eyes and fins (provided). String the memory verse card onto the yarn “hook” before the children take them home. I got the water bottle fish idea from daniellesplace.com (which is one of the first sites I go to when I need ideas for Sunday School). 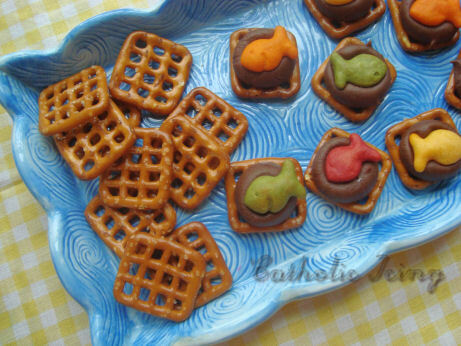 Line pretzels on a baking sheet. Top each with a Hershey’s Kiss. Allow the chocolate to melt slightly in a 200 degree oven. Remove and top with goldfish cracker. Allow to cool. Store in airtight container. 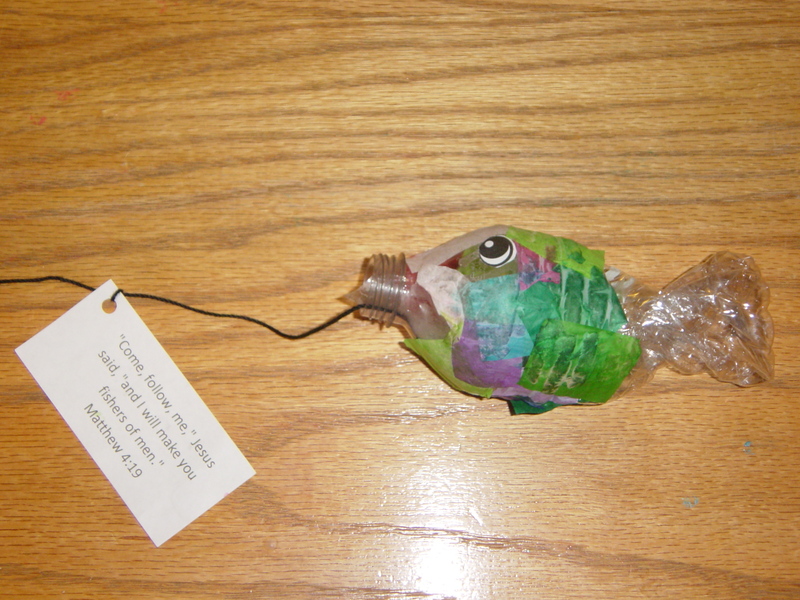 Kathy, thanks for giving credit to Danielle’s Place for the water bottle fish craft. I was wondering if I can use your picture of the water bottle fish on Danielle’s Place under the same fish craft with a link back to this page of your blog.